Naturally, the period leading up to World War II (1939-1945) was unsettling. Arup's wider family, who were spread over many countries, worried about where to go and what to do. They were all making financial preparations, including Arup. In his professional life, the approach of another war enabled him to think on his feet. He was to use his time productively, making significant contributions to the construction industry and the war effort. In 1938, Arup had left Kier to set up Arup & Arup Ltd, although he continued his collabration with Lubetkin and Tecton. With the coming war, people's minds were turning to preparations for the protection of the populace. Through Lubetkin, Arup was appointed consultant to the then left-wing Finsbury Borough Council. Finsbury was a working-class area with many condemned buildings and they wanted Arup to help them meet their statutory obligation to provide air-raid shelters, cheaply. Arup developed a deep shelter design with double-helix spiral ramps, air conditioning, sleeping accommodation and toilets. The shelters were to be used for car parking after the war. Arup's experience with maritime structures, with their emphasis on sub-ground wall strength, stood him in good stead. His shelter was six basement floors deep with a very wide entrance — enough to allow 7,600 people to enter in 3 minutes. However, the publication and exhibition of his proposals enmeshed him in a controversy that was to last for years. People were looking to Spain and events of the Spanish Civil War for lessons in how to protect urban populations but the political nature of that conflict inflamed viewpoints in Britain. The government opposed the idea of deep shelters apparently for economic reasons. Political arguments raged. More determined than ever, Arup published further articles on London's shelter problem, circulating them among influential people including socialists, architects and engineers. However, deep shelters were too contentious and his designs were not implemented. From 1940 onwards, Arup consulted on many other projects connected with defence, although most were small. They included numerous other shelters, underground workshops, tunnels, reinforced water and oil tanks, hangars, pillboxes, water towers, gun sites, slipways and concrete barges. In 1942, Arup & Arup started work on the secret underground HQ for RAF Coastal Command located at Northwood not far from Arup's home in Harrow. It was a difficult job as the local clay kept moving. Then came a top secret and very significant project for which his earlier work on jetties was the perfect preparation. In 1944 he designed and built, with Ronald Jenkins, the concrete pierhead fenders for the Mulberry Harbours, the gigantic floating enclosures and piers used by the British and American-led forces for the Normandy Landings. Arup's brilliant contribution was his improved design of Baker fenders, named after a then scientific adviser at the Ministry of Works. Incidentally, Baker had been at Kier at the same time as Arup. The fenders were designed to absorb the shock impact of loaded landing craft approaching at speed, guiding vessels and preventing damage to the main pierhead. The harbour was constructed in sections at eleven different sites, many of which were in Scotland. It included 10 miles of floating bridge, 6 miles of concrete caissons and 23 bridge heads. Over 45,000 people worked on it, largely out of sight. Arup later discovered that many of his colleagues and friends had contributed including Ralph Freemam, Alan Harris and Oscar Faber. During this time Arup wrote and published extensively, although he rarely mentioned his war contributions. The Arup archives are rich with pamphlets, letters and proposals as well as doodles and musings. It was an especially prolific letter-writing period for him, as he strove to retain his connection with his family as well as his country. In 1940, his close family was increased by the arrival of a second daughter, Karin, born in July. 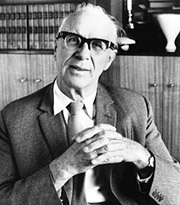 Arup was keeping close ties with the Danish through reading underground newspapers — he quoted from one in a radio broadcast. He also harboured many Norwegian fighters and 'Free Danish' airmen in his house in Virginia Water. The Arup family household became a haven of spiritual support and Arup found himself with another kind of family, not blood but adopted. In London he felt at home in the company of artists, and at ease with the emigré community in Fitzrovia. In February 1944 Arup became a member of the Government Prefabrication Committee. Working as part of a larger research group known as Arcon, Arup contributed to a design for one of the Ministry of Works' standard prefabricated houses. The architect was Edric Neel, who had worked with Wells Coates and Denys Lasdun. Arup provided the structural design for the steel frame. 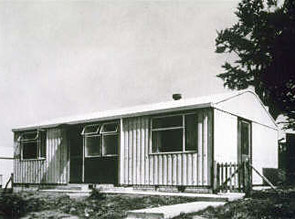 The Arcon prefabricated housing submission to Ministry's call for designs came to life as Arcon Mark V. More that 40,000 of the Mark V standard prefabricated houses were later constructed, the last in 1964. Some survive and are still lived in today. The war years were hectic and demanding for Arup. He suffered ill health and dental problems but kept on nonetheless. In July 1944, a burst blood vessel caused by an ulcer put him in hospital. Illness gave him time to think. He was now fifty years old and ready to review his ideas. Working as part of a research group known as Arcon, Arup contributed to a design for one of the Ministry of Works' standard prefabricated houses, providing the structural design for the steel frame. The Arcon prefabricated housing submission was known as Arcon Mark V (pictured), more than 40,000 of which were constructed by 1964.